Is lasagna good for you? Spinach lasagna is like any dinner idea. You can make a healthy version, and you can make an unhealthy version. So, what makes lasagna healthy or not? 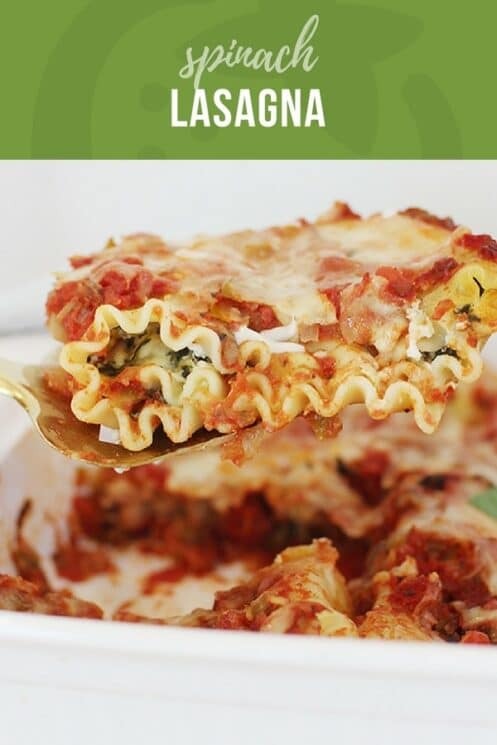 Veggies: Any lasagna that includes vegetables, like spinach, will be healthier! Vegetables are low in calories, while packed with nutrients. 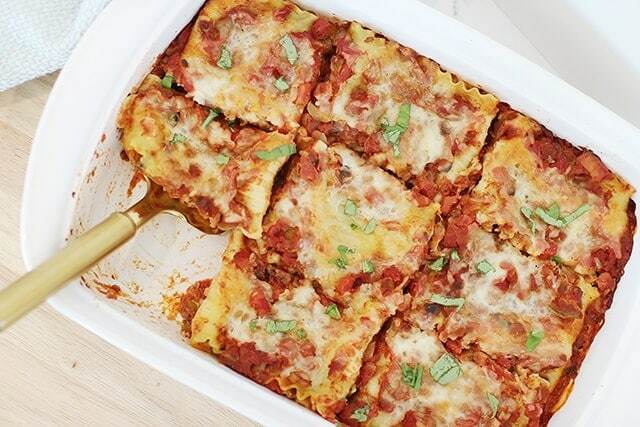 If you take a bite of lasagna packed with veggies, you’ll get more nutrients in that bite than if the lasagna was simply cheese and pasta. Tomato Sauce: Tomato sauce seems innocent enough, but unless you read the label, or can your own, you might be getting more junk that tomato. Check tomato sauce labels for added sugar, salt, preservatives, or chemicals that you can’t pronounce. Meat: While we definitely are a meat eating household, quality of meat does matter when it comes to feeding your family. This spinach lasagna is vegetarian, so we didn’t need to consider the meat. However, knowing where and how your meat is raised is helpful in knowing where to spend your grocery money. When possible, opt for grass-fed meat. Grass-fed, as opposed to grain-fed beef, contains more of the healthy fat, as well as more vitamins like vitamins A & K (source). 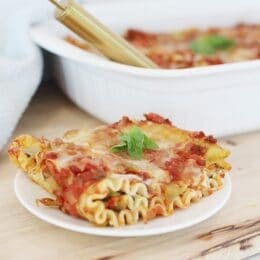 Can you make spinach lasagna with fresh or frozen spinach? 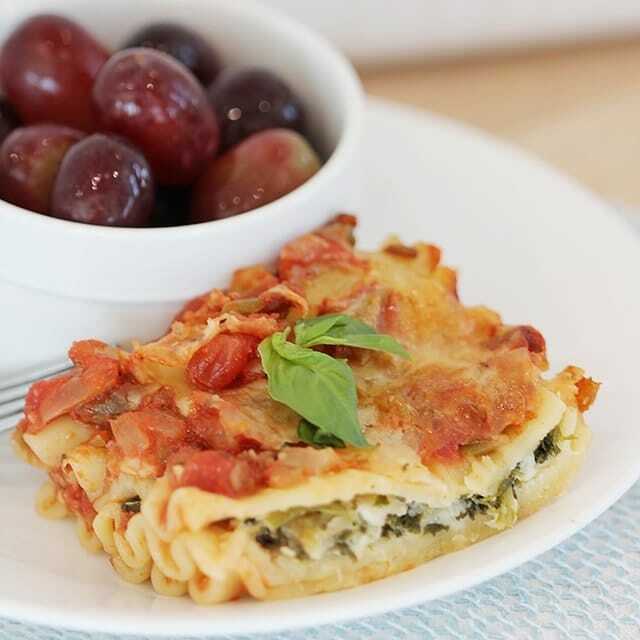 And finally, the best and healthiest component of this lasagna is the spinach! I’ve made this lasagna with both frozen spinach and fresh spinach. My family prefers the fresh spinach,but you can test them both and decide for yourself. Frozen spinach has a stronger flavor because it’s been cooked and the flavors are more concentrated. You get more spinach in a single cup of frozen than fresh. While frozen spinach and fresh are equally nutritious, by quantity, there is a lot more spinach per cup of frozen spinach. This makes it easier to get a lot more nutrition per cup. 1 pound of fresh spinach, concentrates down to 1 1/2 cups of cooked or frozen. For the spinach in this recipe, we mixed the frozen and cooked spinach into the cheese mixture. Fresh spinach has a milder flavor. It’s usually quite pleasing to kids, because the taste is not very strong and takes on the flavors of the food it’s served with. You use less spinach in recipes that call for fresh, than recipes that call for frozen. If your recipe calls for 1 cup of frozen spinach, you can use 1 pound of fresh. If you are making spinach lasagna with fresh spinach, I like to layer the spinach leaves between the layers of the lasagna, rather than mix it into anything. So, give the kids a dinner you know they’ll love, and take some of our advice to make it healthier by adding spinach to the lasagna tonight! 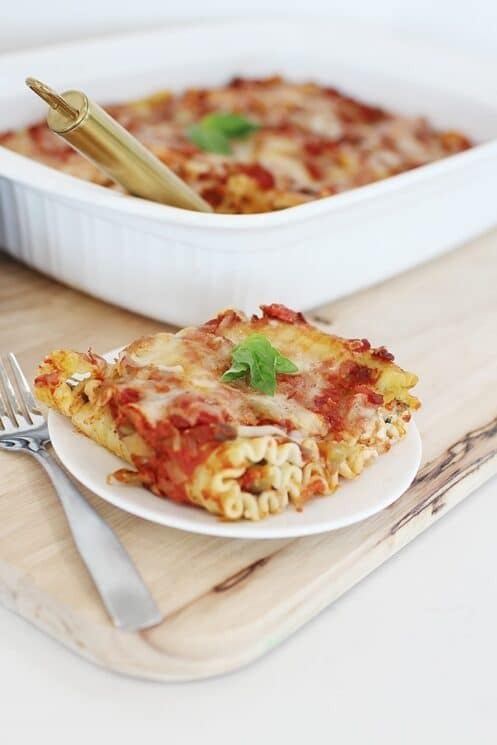 For more lasagna recipes, check out these! Cook spinach and lasagna noodles separately, according to the package directions. Drain and set aside. Place spinach on a clean kitchen towel and wring out excess moisture over the sink. Set aside. For the sauce, chop the onion and green pepper; mince the garlic. Spray a large saucepan with nonstick cooking spray; heat over medium heat. Add onion, green pepper, mushrooms and garlic. Cook for about 5 minutes or until vegetables are tender. Stir undrained tomatoes, basil, tomato sauce, sugar and black pepper into the vegetables. Bring to a boil; reduce heat. Simmer, uncovered, for 5 minutes or until slightly thickened. For the filling, stir together spinach, cottage cheese, Parmesan cheese, egg and nutmeg in a medium bowl. Spoon 1 cup of the sauce mixture into a 9×13 pan. Place lasagna 3 noodles into dish, covering sauce. Spread 1/4 cup spinach mixture onto each noodle. Lay 3 noodles over spinach mixture, spread 1 cup of sauce on top. Continue to layer, ending with a layer of sauce. Sprinkle with grated mozzarella cheese. Cover with foil. Bake for 40-45 minutes or until bubbly. Remove foil and bake an additional 5 minutes. I like this recipe because it is healthier than others I made. i agree on grass fed beef but when you are on a very limited budget you cannot afford the higher priced beef. Made this this morning, it came out great! I added a whole zucchini and some green olives to the sauce because I know everyone will eat them. I used fresh spinach boiled for a few minutes. I also forgot to put tin foil over the dish but it didn’t seem to matter. Honestly nothing I would do different next time; it was so delicious and everyone loved it! your dish is really delicious.It helped my kids eat more healthier.THANK YOU I really appreciate it.